Vijay Sethupathi's Junga trailer and audio have been released on Wednesday. The video is packed with funny dialogues and action. Vijay Sethupathi had proved through his earlier films that he can effortlessly enact the role of a don. While his performance in Vikram Vedha is still fresh in the minds of his fans, the Makkal Selvan is coming back as a gangster in his latest movie Junga. In Vikram Vedha, Sethupathi portrayed a character of serious nature, but he will be seen as a fun-filled don in the latest flick. The trailer launched on Wednesday, June 13, has given away some glimpses of his role. The video is packed with funny dialogues and action. Vijay Sethupathi impresses in both, dhoti-clad avatar and stylish gangster suit. The trailer does not give away anything about the storyline but indicates that the Tamil film tells the journey of a local rowdy to an international gangster. Sethupathi mannerisms have garnered instant appreciation. Sayyeshaa looks beautiful, while Madonna Sebastian charms in her limited screen presence. Radha Ravi, Mottai Rajendran, Yogi Babu, Saranya Ponvannan and many others are seen in the short clip. Siddharth Vipin's apt background score and Dudley's cinematography are other attractions of the trailer. Last but not the least, the way the cinematographer has captured the chase sequences should get a special mention. 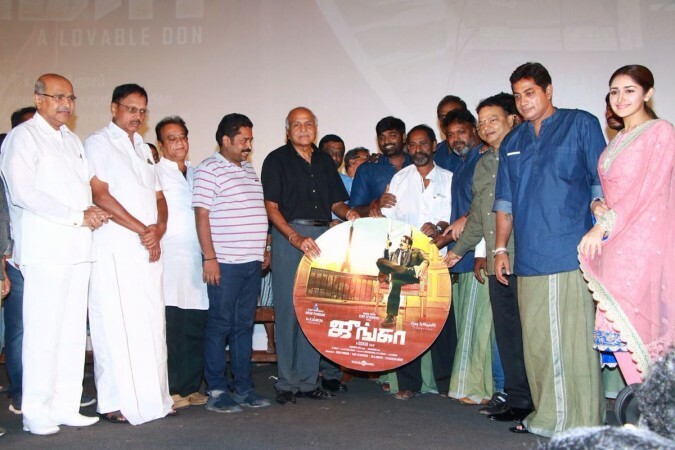 Meanwhile, the audio and the trailer have been formally launched on Wednesday in an event in Chennai. Four songs from the movie and the promo videos were played for the media and guests. Gokul of Rowthiram fame has directed Junga, which is produced by Vijay Sethupathi himself.